This post is coming in slightly late. 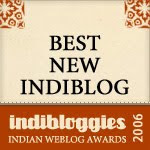 Nevertheless, we are determined to share with our readers, the very final list of our "favorites" in the year 2009 from three of our contributors. A bilingual book from Tulika, we have it in English and Hindi. The quaint little story is by Niveditha Subramaniam and it is wonderfully illustrated by Kavita Singh Kale. The tale is simple and imaginative- a King who loves jalebis ( Indian sweet) so much that he even dreams of them. He imagines anything curled, such as the queen's earrings, the moon, flowers. all turn into jalebis.Then the dream, turns into a nightmare when his moustache is under attack. He awakes to find one hot crisp jalebi awaiting him. And all is well. It is just pure fun and if that is not enough reason to keep reading it , it is also excellent for early readers and for introducing a new language to children. I am fond of geography. To introduce the concept of address and boundaries or rather no boundaries, is this book from Tulika- Sameer's house. Written by Deepa Balsavar and Deepa Hari and with evocative illustrations by Nina Sabnani, this book is much liked and adapted by us at home, by substituting Sameer with other people and thereby learning about new places. Sameer lives in a house on a road called Saraswati Street in the city -Mumbai, the state of Maharashtra, in a country India, in a continent Asia . . . ending with the universe. A very powerful way of depicting where we are in the larger scheme of things. 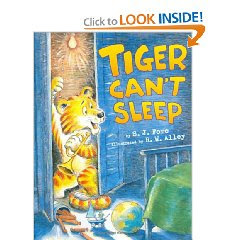 My younger one (3 yrs old) is fascinated by this book titled "Tiger Can't Sleep". The story is all about a tiger (a pet one I suppose) sitting in a closet and not letting a little boy (about 5 yrs old) fall asleep. The tiger snacks on crunchy chips, turns the light in his closet on and off, plays a musical instrument and so on. The noise annoys the boy. He tries to persuade the tiger from stopping to do all of these, but can't quite get him to listen. Eventually, the tiger tells the boy he is afraid to be alone in the dark closet, and that he wants to snuggle with the boy in his bed. The boy, quite tired by this point nods. The next minute, the tiger jumps into the boy's bed. And guess what, in a jiffy, the tiger falls asleep. Is the boy able to sleep now? No way! Well, how can he when there is a tiger snoaring in his bed? Well, as for my daughter, she loves the page in which the tiger-cub character eats potato chips. Of late, she is starting to appreciate the funny twist in the end. The illustrations portraying the tiger's expressions are amusing. This book has shown up very often at our bedtime, read-aloud routine, hand-picked by my little girl. 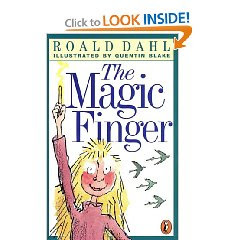 If my seven year old were to pick one book that she thoroughly enjoyed reading by herself in the year 2009, that would be The Magic Finger, by Roald Dahl. The book in fact was the first short novel, (fiction peppered with fantasy (magic), if I may, by an author of classics) she had picked during the first month of her second grade year. Prior to this one, all the other books she had read were part of some "realistic" fiction character-based series or the other - Arthur and friends and Ivy and Bean, being her favorite series in her first grade year. The Magic Finger is a story about a little girl endowed with magical powers on her finger that she can use to turn people into any thing she imagined them to be. She lives on a farm and has some strong views against hunting. She can't stand her neighbors, the Gregg family for hunting geese, squirrels and other small, wild animals. Annoyed, she tries to talk and convince them to stop killing the wild animals. She gets mocked at, which makes her even angrier. She decides to use her magic finger turning them into ducks. My daughter thinks the anti-hunting message and the funny imagination about neighbors turning into ducks, are the two main reasons she would recommend this book to others. As for me, the content around hunting, I thought would be a bit intense for her. Contrary to that, I was pleasantly surprised and happy to see that the book became a hit with her. "I asked J to name 5 of her most favorite books of the ones she read in 2009. 2 was not nearly enough She wanted more like 10. So the top 5 as per J were..."
Art: Loved the way you guys adapt the story in Sameer's House. Always exciting to read what amused other kids! Thanks again Sathish! Good to see Jalebi Curles in the list here! Very interesting to read this ! Kavita Singh- I think your illustrations are fabulous and the colour palette of that book was gorgeous! !